How do you get a passport for an infant? 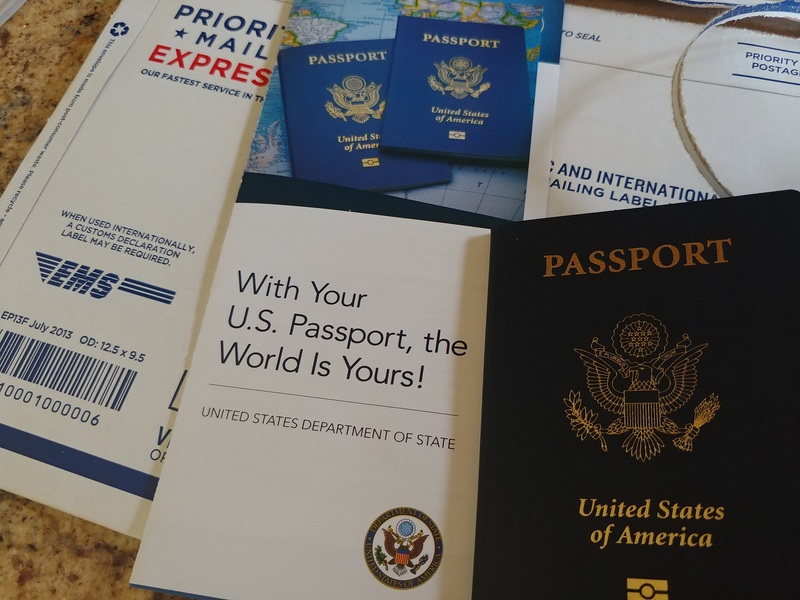 Since starting our parenting 101 course earlier this year, we had to get our little professor a passport for our first field trip abroad, so we recently found ourselves asking that very question. Turns out you do it the same way as you do for an adult: take a picture, fill out a form, submit it with proof that you are you. There are a couple of small differences — you have to submit it in person at an acceptance facility and either both parents must appear with the baby or one needs a notarized absence excuse (or other associated proof). Just like an adult passport, it can be expedited for a fee and turnaround times are very good on an expedited application — Baby Rey’s came in the mail on the 8th day from submitting his application. Passports come in two sizes — “standard” (28 pages) and “large” (52 pages). The cost is the same, so if you travel often you’ll want the larger book. I’d always suggest getting the larger book since you can no longer add pages to a current passport; if you fill it up, you’ll have to apply for a renewal. In other words, you’ll end up paying double the cost if you don’t get the big book from the get-go and end up needing it. But we didn’t get the larger book for our son. That was not intentional. The State Department site gives you two options for completing form DS-11: either print a PDF copy and write out the form or use their “form filler”, which gives you a series of boxes to fill in online and then generates a printable, typed PDF format with your answers pre-filled. I type a lot faster than I write, and I have never been accused of having remarkably legible handwriting, so I was happy to do the online form-filler. I filled in the blanks it provided and hit print. Truth be told, I may not have looked at it closely beyond making sure his name and birthday were correct. Rookie mistake. It wasn’t until I put his passport together with ours that I realized his was so much thinner and I caught my mistake. I went back to the website and saw that you can choose the standard or large passport with a check box at the top of form DS-11. I pulled up the PDF copy of his passport application that was generated by the form filler….and sure enough, it marked “regular” even though I am 99.8% sure that it never asked which we wanted in the form filler. Argh. I don’t remember the form-filler asking for a preference on this. On the bright side (umm…sort of), passports for children under 16 are only valid for 5 years, versus the standard 10 for adults. That’s kind of understandable since the way a child looks will vary significantly as they grow. Unfortunately, they don’t charge you half price for a passport with half the validity period….though you do get a little bit of a break, paying about thirty bucks less for a child’s passport. I don’t know as though we will travel enough before he is 5 to run out of space — but neither will I be too excited about a third round of passport fees between now and the time he is 10 if we have the good fortune of travelling more than I expect. I regret not looking at that more closely. You only need to submit one photo with the passport application (2″x2″), but most places that take them print them in sets of two. Turns out that’s not a bad thing — the employee accepting our application said it is a good idea to keep a spare on you in case you lose your passport while you’re abroad and you need to apply for a replacement. I imagine the photo is probably not the most challenging part of getting your passport replaced, but it’ll be easy enough to toss an extra of each of us in the travel bag with other emergency stuff, so I’m glad to have gotten two. In terms of the photo itself, the rules are more lax for children than adults (though they still appear to be fairly strict in some ways). For an infant, they suggest either lying the baby on a white blanket or sheet so that the baby’s head is supported without a hand (you can’t have anyone else in the photo). Alternatively, and likely much easier, is to cover a car seat with a white sheet and take the photo in the seat. Interestingly, “A photo with the child looking at the camera is preferred, although not required”. That at least makes your life a little easier. On the other hand, if you see the page on passport photos and you look at the examples of “children” photos, you’ll see that they are particular about how the photo should look — no shadows, no objects, the face can’t be obscured, etc. I tried to take my own photo at home, but I kept thinking there was a little too much shadow cast by his head or it wasn’t quite clear enough, etc. This one was probably the best of the bunch I took (with my phone), but I wasn’t sure if he could be smiling (as adults can not smile). So off to Rite Aid we went to hire an expert. The location we chose had apparently never done an infant photo before and the worker seemed uncomfortable with it, but we eventually convinced her to just grab her camera and snap a photo so we could print it and get to the post office (our local acceptance facilities are almost all post offices) before it closed. It took a couple of rounds to get it right as the Rite Aid employee seemed to struggle a bit with it, but we got it done. I was concerned that the photo was still a little overexposed, but we didn’t have much time to spare, so we took it to the post office. The postal employee ensured us that the photos were fine. On the plus side, I had Googled “Rite Aid passport photos” before leaving the house and found that on their deals page they had a coupon for $7 passport photos (regularly $14). I was happy to save a few bucks somewhere. That coupon has since expired, but here’s the page with printable coupons where you can check for one in the future. We opted not to get a passport card, so the cost was $115 before the fees to expedite it. Expedited service costs an additional $60 and you can pay $15.89 for 1-2 day delivery on top of that (which we did). How fast can you get an infant passport? The State Department site says that standard processing time is 4-6 weeks and expedited processing is 2-3 weeks. In our case, it took 8 days. That’s calendar days, not business days. I was impressed with the speed of turnaround time. I was also surprised the day it came in the mail because I had checked the application status the night before the passport arrived and the status said that it was in the final processing stages and would be mailed on approximately [Date X], where that date was still a few days in the future. Obviously, the status checker didn’t have the most up-to-date info since not only was the processing done, the passport was on its way to be delivered. The process of getting an infant passport is pretty easy. The State Department website has the key info you need. That said, if I had it to do over again, I would have printed form DS-11 and handwritten it. Then, I’d have likely caught the check box for the larger passport. Keep in mind that both parents will need to appear or you’ll need additional documentation and that you’ll need to tell the acceptance officer if you need to expedite the process (I indicated this in the form filler, but it doesn’t actually show up on the application). While standard processing time is 4-6 weeks, you might be able to get it in just over a week with expedited processing if you’re in a hurry. If you need it faster than that, you might be able to make an appointment for same-day service at a passport agency or center — I had to do that once as an adult and do not see anything indicating that this would be impossible for a child if you are in a pinch. Otherwise, the mail service is plenty efficient if you’re planning even a little bit in advance. Our kids are 7 & 9, but we just had their passport pictures taken right at the post office. This saved us a trip. The post office where we were submitting the application does do photos also (the post office in our town does neither photos nor is it an application acceptance center). However, the post office that does the photos and accepts the applications requires an appointment for photos….and they aren’t a particularly chipper lot in that office to say the least, so we were trying to save time and hassle at Rite Aid — our mistake. We had to make an appointment at our local post office. Not all branches in our area handle passports and the ones that did had a cutoff time of 4pm for the last appointment. We had to do our newborn and renew our 5 year old daughter’s passport too. This meant we needed two 15min appointment slots grouped togheter (a 30 min block). Since we had to renew our daughter’s passport as well, she had to be there in person. So basically all parents and kids had to be there in person, meaning that work and school schedules may leave few options open for some folks. I made the mistake of doing the forms at home and printing them out DOUBLE sided. This was a mistake, the forms have to be SINGLE sided. We had to fill out new forms on the spot for both kids. Thankfully the postal officer was patient and actually helped us with this. We opted to use personal checks to make the payment for the passports. It is important to note that your checks must be named (i.e.have one or both parents names / address on the checks). This might’ve been an issue for us, since I almost never write checks, so I had the original default (no name) checkbook that Ihad been using for years,. You know the one the bank gives you upon account creation. But it only had a couple checks left so, I before we left for,the appointment I grabbed a new (named) checkbook just in case I made some errors filling them out. On the plus side, doing both kids at the same time meant that they both now have the same expiration date 5 years down the line, so it’s a bit easier to keep track of. Great timing on this info. I’m heading to the post office tomorrow to take care of a newborn passport. I had a couple questions regarding which IDs I needed for myself and my wife, but now I’ve got the answers. Thanks! Anyone have good info on getting a new passport for a 10 year old after his passport expires? From what I can tell BOTH of his parents have to be at the office to apply. Being separated and living 2500 miles apart makes this very difficult. Any advice? Thanks, Cheryl. This is exactly what I was going to say — there is a form the other parent can fill out. In #7 at the link Cherly cites you’ll find what to do if one (or both) parents can’t appear in person, what to do if someone has sole custody / the other parent is incarcerated / etc. It’s got the main contingencies. The main purpose of having the parents appear is to make sure you aren’t taking the child out of the country without the other parent’s consent. If you have that, it can be done without both appearing. If your case, I’d definitely do the form. In my case, while it would have been more convenient for one of us to go rather than both, we were in the position where we *could* both go, and I didn’t want to risk anything that would slow down the process. What is the safe travel age for a baby? My baby will be born in September and I am planning a travel to Asia in January next year. I couldn’t find a good answer over the internet. Most airlines will let them fly once they are 14 days old (or maybe it’s 10 days?). Our doctor said it should be fine after that in terms of being safe to fly, though since our son was born in flu season and it seemed to be a particularly bad flu season, we didn’t feel comfortable flying with him until we had to in May. Now, my fear is his temperament more than his health (not that I’m unconcerned with his health, he just seems very healthy and strong). Asia is a long distance, but everyone says the first 6 months are the easiest to travel for what that’s worth.